Penne alla Vodka gets a nutritious makeover with this Healthy Pasta alla Vodka! 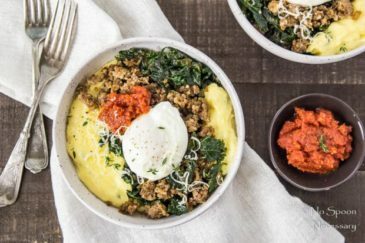 This dish swaps out pasta for spaghetti squash and adds hearty sausage, earthy kale and pine nuts for a comforting and delicious dinner that doesn’t sacrificing flavor! Helllllllo Lovelies! How was your weekend? You do anything exciting? Or, did you stay in the comfort of you pajamas and warmth of your house, recovering from the brutal first work week of the New Year? I worked on blog related shenanigans all day, both Saturday and Sunday. I just can’t help myself! I love being in the kitchen developing recipes. I love forcing Boy to taste test every single creation, even when it needs a LOT of tweaking. (<– Insert evil grin here) And, I love sharing the recipes with you guys when I finally get it right. So sue me. I worked on NSN stuff both days. There are far worse things I could do. Am I right? Anyways, while I did break one goal, I also did accomplish one goal. I forgave myself. Woot woot! You see these pictures here today? I hate them… and that’s putting it lightly. But, I forgive myself for taking crappy picture of such a delicious dish. So I’m posting them anyways. I may be grimacing, with pain radiating from my eye balls due to the site of these photos, but I forgive myself. One goal for 2016 accomplished. So what are these (awful) pictures of? 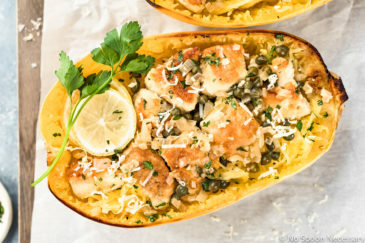 AKA – Spaghetti Squash alla Vodka Boats. I absolutely adore penne alla vodka, but what I do not adore are all the calories that come with it. 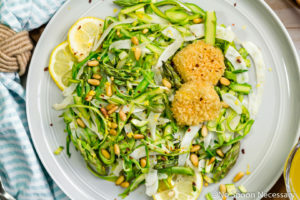 So, I decided to give one of my favorite comforting dishes a healthy makeover… while adding tons of additional flavor. I nixed the penne in favor of one of my favorite spaghetti substitutes – squash – and, I cut the amount of heavy cream significantly. 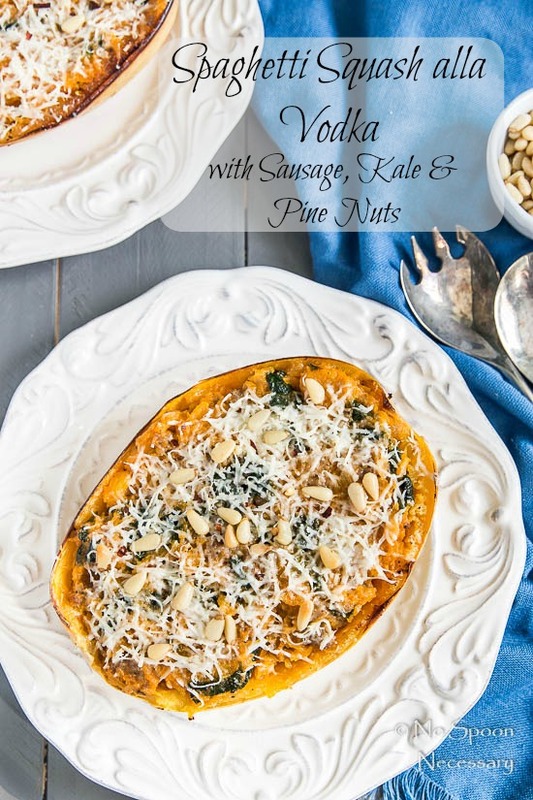 Then, I added kale for tons of nutrients and omega 3s, pine nuts to help boost your energy and reduce your risk for heart disease, crumbled mild sausage for a bit of hearty comfort and asiago cheese because, well… cheese makes me happy. 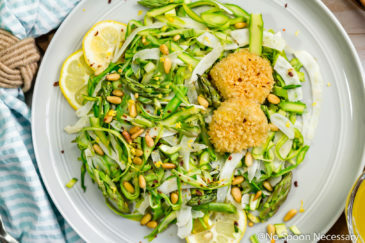 Besides, 1 ounce serving of asiago has 7 grams of protein and it is a rich source of calcium. 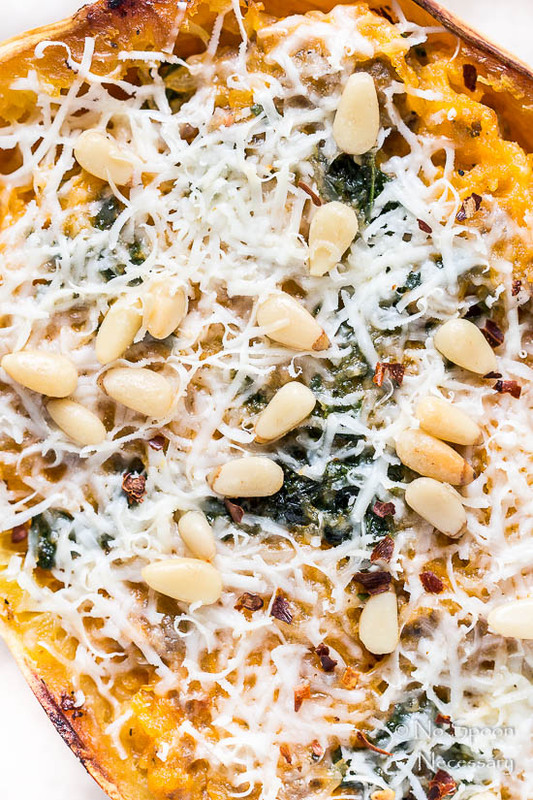 With silky, smooth strands of squash, chunks of juicy, salty pork sausage, oodles of earthy kale, a sprinkling of crunchy pine nuts, and a smoky, sweet, slightly spicy, barely boozy, roasted red pepper sauce, this made-over, healthy pasta alla vodka is ultimate in the comfort food department. These boats are savory, saucy and seriously delish. I did make this spaghetti alla vodka over the weekend, but with a little planning they can be weeknight dinner obtainable! 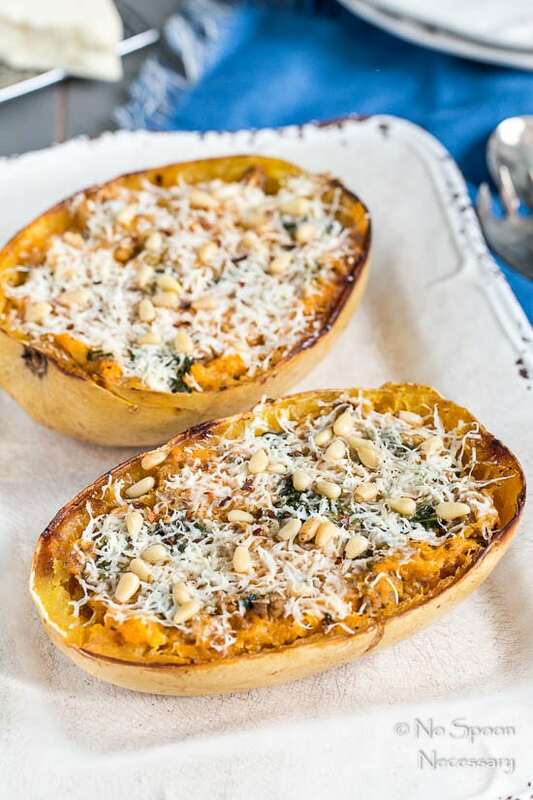 Simply bake your spaghetti squash prior, scrape the strands from the skin and store in an airtight container in the refrigerator. 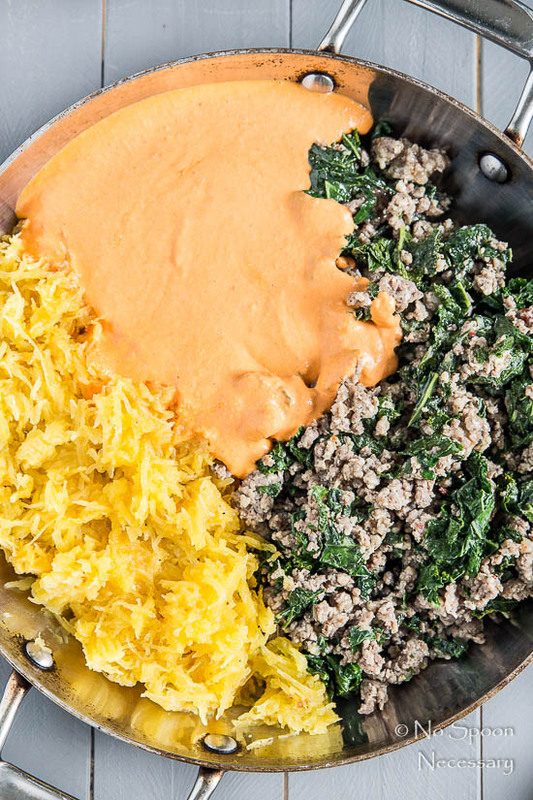 When you are ready to get your alla vodka on, simply prepare the sauce and cook the sausage and kale. 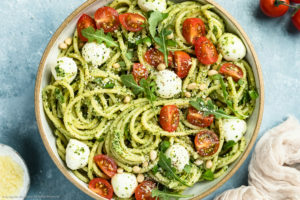 So if penne alla vodka is your jam, but you are trying to be a healthier new you, I urge you to try this healthy pasta alla vodka. 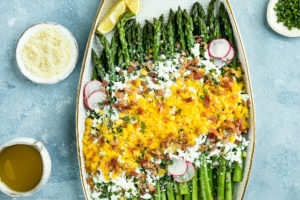 Loaded with flavor and healthy eats, I know you and your family will love these boats as much as we did. Until next time, Cheers – to never sacrificing flavor. Penne alla Vodka gets a healthy make over! 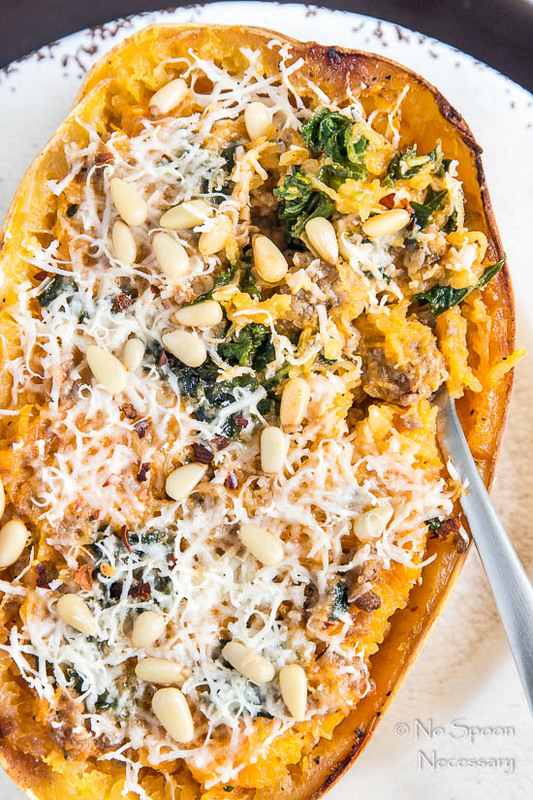 With Spaghetti squash substituting for the penne, a significant reduction in the amount of heavy cream, and the addition of sausage, kale, pine nuts and asiago cheese, these boats are comforting and delicious without sacrificing flavor! 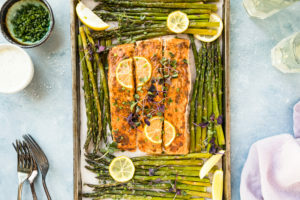 Cook the Spaghetti Squash: Preheat the oven to 400 degrees F. Prepare a baking sheet with aluminum foil for easy clean up. 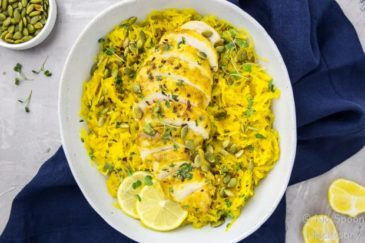 Drizzle, or use a pastry brush to apply olive oil to the flesh (insides) of the spaghetti squash. Season liberally with salt and pepper. Transfer squash, cut side DOWN, to prepared baking sheet. Roast in the oven until easily pierced with a fork and cooked through, about 45 minutes. Remove from oven and set aside until cool enough to handle. When cool enough to handle, use a fork to scrape strands from the skin of spaghetti squash. Set aside. Meanwhile, Make the Vodka-Roasted Red Pepper Sauce: Over medium heat, melt the butter in a medium sauce pan. Add in the shallots and cook until soft and translucent, about 4-5 minutes. Add in the garlic, tomato paste, crushed red pepper, ¼ tsp salt and a pinch of pepper. Cook until fragrant, about 1 minute. 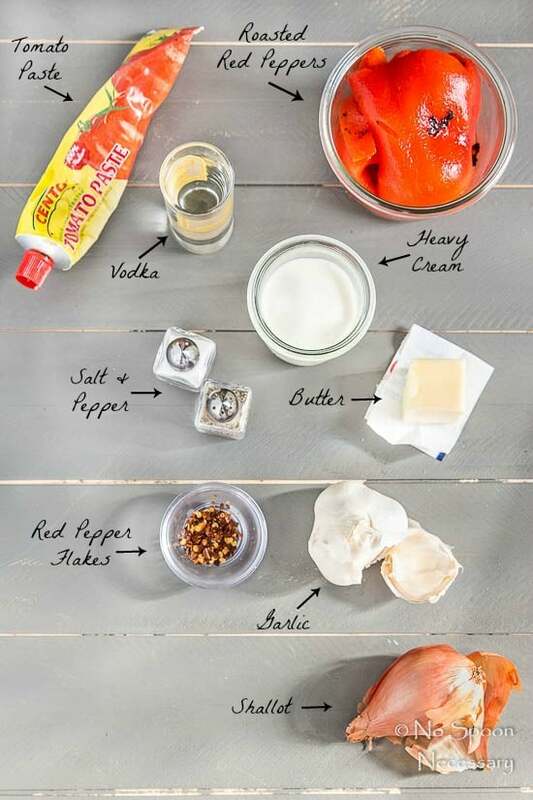 CAREFULLY add in the vodka and cook for 1 minute. Stir in the roasted red peppers. Cook for 8-10 minutes, stirring occasionally. Use an immersion blender, or transfer to a stand blender, and puree until smooth. (If using a stand blender, transfer back to sauce pan). Add in the heavy cream and cook until warmed and incorporated, about 2-3 minutes. Taste and adjust for seasoning with salt and pepper. Set aside. And, Cook the Sausage: Heat 1 tablespoon olive oil in a large skillet over medium-high heat. Add the sausage and cook until brown, stirring occasionally and breaking up into pieces, about 3-4 minutes. 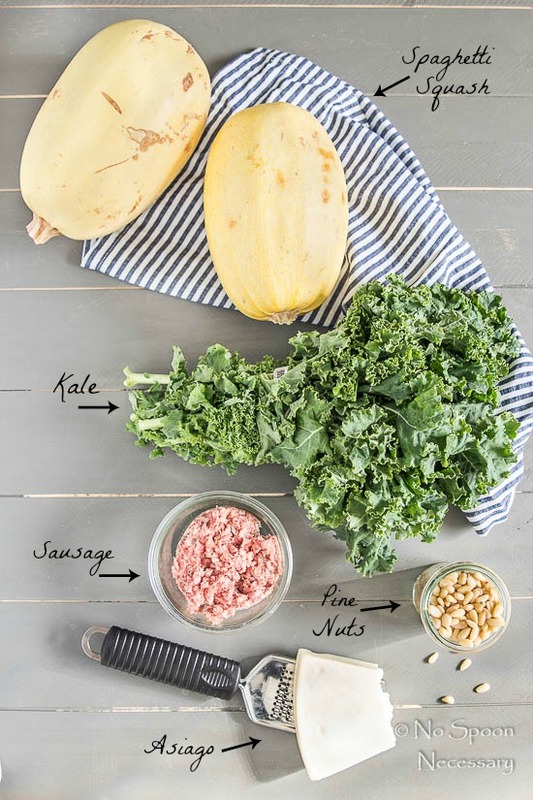 Add in the Kale and season with ½ tsp of each, salt and pepper. Continue to sauté another 3-4 minutes. Transfer mixture to a bowl and set aside. To Serve: Transfer the empty large skillet with sausage drippings back to the stove over medium-low heat. Add in the spaghetti squash strands, sausage mixture and pour in sauce. Toss to coat. Heat until warmed throughout. 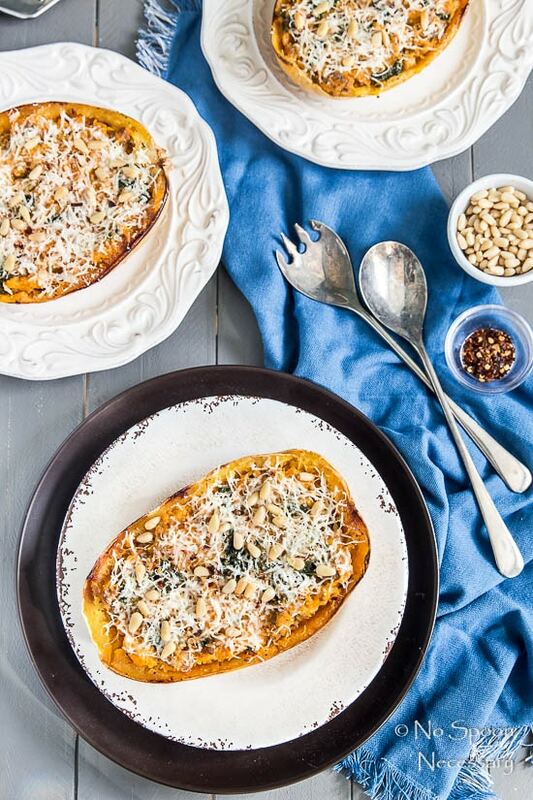 Divide spaghetti squash between bowls or empty squash boats. 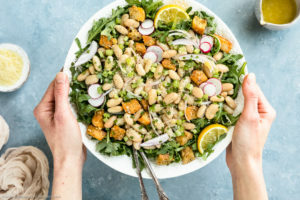 Top with pine nuts and asiago*. Serve and Enjoy! 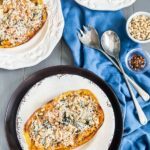 *Optional: Place stuffed squash boats on an aluminum lined sheet pan. 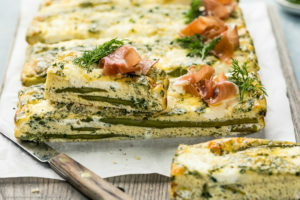 Bake in a 350 degree oven for 10-15 minutes or until cheese is melted.